Mission seniors Alyssa Garza, left, and Alejandro Martinez are recipients of a full scholarship to the University of Texas at Austin. They are seen Friday, Dec. 1 2017, at Mission High School. MISSION — High school senior Alejandro Martinez was weary of his family receiving an uncommon visit the morning after Thanksgiving when he saw his parents clearing out boxes from the entryway, he said, but he never imagined the visit would be a unique opportunity to attend his college of choice. As Martinez, 17, opened the door to his Mission home, he was surprised by University of Texas officials carrying balloons, a letter of acceptance at the UT-Austin Cockrell School of Engineering and a giant check for $40,000. He was one of four Rio Grande Valley students to receive the Impact Scholarship and the surprise visit. And in another special turn of events, his girlfriend and fellow classmate, Alyssa Garza, 18, was next on the list for the surprise visit. The two attend Mission High School T-STEM Academy and will begin their college career at UT next fall. Two other students including Jose Gonzalez, of Pharr, received the scholarship, but the name of the fourth student has not been made public. Both Garcia and Martinez want to pursue a career in aerospace engineering and one day lead research in the Valley, they said. UT was at the top of their list after attending a summer camp through the T-STEM Academy, but the only and greater hurdle was financial, considering they both thought tuition would be too costly for their families, they said. Through the Impact Scholarship, the students will receive $12,000 for four years to cover tuition costs. This is the first time that UT delivers the news to students with this at-home surprise factor now called Longhorn Scholarship Surprises. The university recently created a new enrollment management division, which is testing new ways of engaging with prospective and current students, said Miguel Wasielewski, UT associate director of operations at the office of admissions. University officials hope the new effort will help them better connect to students, their families and the community. Getting to see not only the student’s reaction but that of their family is a great opportunity for university officials, Wasielewski said, as it offers a glimpse of how important college is for them. “ When you see the parents who have committed so much of their lives in making sure their students have these opportunities is something that brought tears to our eyes,” Wasielewski said. 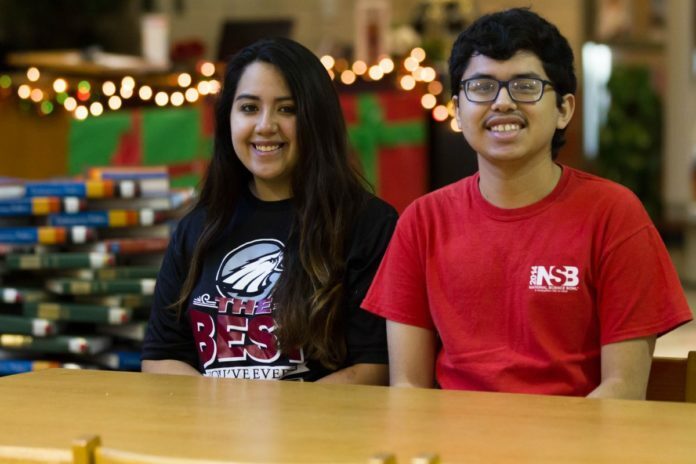 The family aspect of the surprise meant a lot to Garza and Martinez, they said, as their families have supported and encouraged their many efforts to excel at school and reach their goals.